Following the referendum by British voters to exit the European Union (EU), the global economic and market environments have grown far more volatile and uncertain. To be sure, it is unclear what effect — positive or negative — these results will ultimately have on the composition and structure of the EU—as well as on the workings of the global economy. We believe—strongly—that U.S. companies that display strong profitability and effective capital allocation will be rewarded, regardless of the potential consequences of Brexit. Surprising macroeconomic events often lead to severe market dislocations. What we have witnessed over our long tenure— more than 40 years of investing in small-cap stocks— is that participants tend to overreact in the short term, undervaluing the long-term durability and resilience of individual businesses. While the specifics of this event are unique, the market response shows a pattern comparable to previous shocks. Chuck Royce commented, "Seismic events invariably produce significant disconnects between companies' market values and their underlying business values—that is always a consequence of major market disruptions. As active, risk-oriented managers, we seek to use these periods of heightened volatility to capitalize on the mispricings that regularly occur." His thoughts were echoed by David Nadel, Lead Portfolio Manager for Royce International Premier Fund: "The extreme volatility in global equities looks like an overreaction. We'll be diligent in our efforts to ignore the noise and invest intelligently for the long term." We agree. The short-term risks are real, but so are the long-term opportunities. What Does Brexit Mean for U.S. Small-Cap Investors? Small-caps are obviously sharing in the first wave of selling—and are likely to sustain larger losses at this early stage, consistent with the asset class’s historically higher levels of volatility. We are skeptical that small-cap companies will be meaningfully affected by the Brexit decision. In fact, what may potentially shift this short-term pattern is the realization that small-caps as a group derive a far greater percentage of their respective revenues from domestic sources than larger companies. Small-caps carry far less exposure to the global economy. Brexit may create some short-term risks for Royce portfolios, including renewed strength for the U.S. dollar, which could temporarily hurt manufacturing and other cyclical businesses. The possibility also exists of a renewed "flight to safety," that is, the very real prospect of investors piling into defensive and/or high-yielding stocks such as Utilities, REITs, and Consumer Staples, to which we generally have lower exposure due to what we see as their already high valuations. In our view, these are short-term concerns that are not substantial enough to derail what we believe are the significant transitions taking place in the small cap market. By this we mean the small-cap leadership shift over the last year from growth to value, a move that has (unsurprisingly) coincided with stronger results for small-cap companies with steady earnings. Looking out over the next three to five years, we believe—strongly—that U.S. companies that display strong profitability and effective capital allocation will be rewarded, regardless of the potential consequences of Brexit. There will be ample debate as the impact of the Brexit decision begins to settle in. We are likely to hear warnings of crisis and looming recession—with attendant calls for investors to act in accordance with these potential developments. We do not believe that the U.S. economy will imminently fall into a recession. Moreover, we want to remind investors that the U.K. accounts for approximately 2% of global GDP. We are by no means downplaying the seriousness of the decision, but at the same time we strongly encourage investors to step back and take a long-term view. After all, many of the commentators being asked to weigh in and make sense of the current situation are the same people who were caught totally off guard by the vote. So we want to stress that investors should be wary of the conventional wisdom, which is seldom as wise as that phrase implies. We think this is of particular importance right now, when extreme courses of action are likely to be proposed. Listen for prudence, not volume. 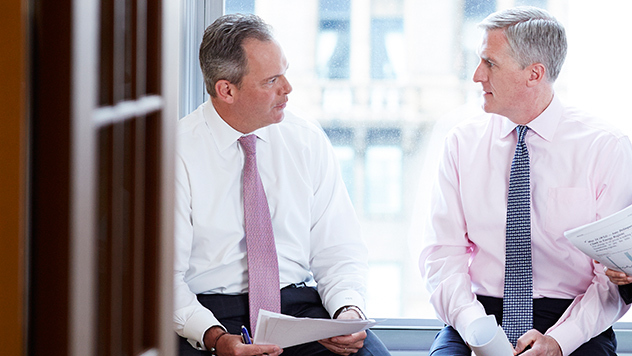 Chris Clark is President, Co-Chief Investment Officer, and Francis Gannon is Co-Chief Investment Officer, Managing Director of Royce & Associates, LP, investment adviser to The Royce Funds. Mr. Clark and Mr. Gannon's thoughts and opinions expressed in this piece are solely their own and may differ from those of other Royce investment professionals, or the firm as a whole. There can be no assurance with regard to future market movements. No assurance can be given that the past performance trends as outlined above will continue in the future.